X-Proxy – поможет посещать Интернет страницы полностью анонимно, не оставляя реальные следы о себе, то есть изменяя IP адрес, именно это и предотвратить вас от атак хакеров и краж данных. X-Proxy is free and allows you to surf anonymously, change your IP address, prevent identity theft, and prevents intrusion from hackers. When your computer connects to the Internet is assigned an IP address of your Internet service provider (ISP). An IP address is a unique identification number used to identify all computers and websites on the Internet and could be used to track communications with all websites or any program that connect to the Internet. This is known as direct Internet connection. 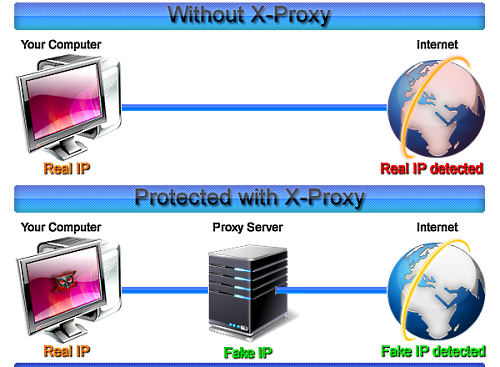 When X-Proxy is running on your computer, you can connect to a VPN or proxy server that acts as an intermediary between a home network and the rest of the Internet and makes requests for information using its own IP address instead of yours.